Villa Nabu is a brand new, private residential villa which offers modern, comfortable luxury and private pool with sun terrace. Villa Nabu is situated in a tropical and lush coconut plantation, part of a private and tranquil residential development in the Plai Laem area of Koh Samui. Just a 5 minute drive to the gorgeous Choeng Mon beach and a 7 minute drive from Koh Samui’s international airport. 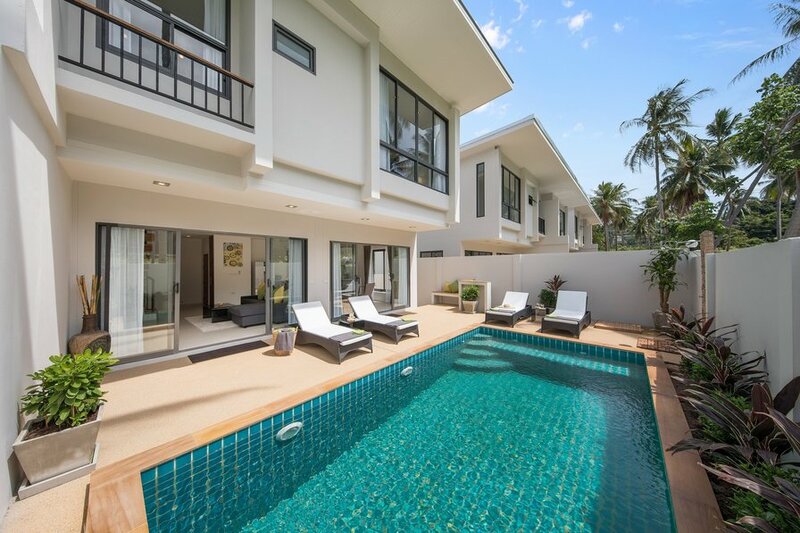 The villa is set over two levels and offers modern, comfortable luxury - perfect for solitude for peace and quiet but still accessibe to popular attractions on Koh Samui. With landscaped outdoor areas and a superb private pool it's the perfect place to spend your holidays in paradise. It can accommodate families who want to stay together or couples looking for absolute privacy and romance. We furnished Villa Nabu to a very high standard and made sure that everything that matters is included. This brand-new, luxurious and spacious villa means you can completely relax in comfort. Entering the villa, you will find a spacious open plan living area including a lounge, dining room and kitchen and there is a downstairs bathroom for guests comfort and a central air conditioning system. The high-end, western-style kitchen is fitted out to the highest specifications, with a polished white granite work surface and high-gloss finish to the cupboards. Completing the kitchen area is a modern 'French-door' Panasonic fridge freezer and an island featuring additional seating. The dining area has a pendant industrial downlight above an infinity tempered glass table. Ceiling to floor, wall to wall patio doors open out to a stunning sun terrace with your very own 7m x 3m private pool, That's a great sized 21sqm of fresh water bathing area! The large outdoor area offers shade from the sun and comfortable high-quality German wicker designed sunbeds along with a BBQ and outdoor sink area. There is an outside washing machine, to minimise any disturbance within the villa itself. Downstairs, there is a 65 inch LG Ultra HD TV (with 200+ cable channels - including TV packages from 13 different countries - including the UK, Germany, France, Italy, Ireland and instant access to a huge library of Movies and TV series), ultra-high speed MESH blanketed wifi (100MB download, 30MB upload), a Nespresso coffee machine (please bring your own pods!) and a well equipped kitchen for those who would like to cook. In the master bedroom and second bedroom, there are 43 inch 4K LG TV's with the same TV packages as the downstairs TV. Upstairs in the three bedrooms, there is built-in bespoke rubberwood wardrobes and furniture, spacious bathrooms with high-quality fittings and lighting. Comfortable king-size or queen-size beds, high end (5* hotel class) bed linens and top of the range Mitsubishi Magic Eye air conditioning (super-quiet) unit along with the 90% black out curtains on the ceiling to floor window will ensure the best night's sleep. Out at the front of the villa is a parking area for at least two cars and several motorbikes, with a small landscaped garden. We offer free villa cleaning and change of sheets and towels 2 x per week. If you require extra cleaning then there is an added charge of 700 Baht per time. We like to think our service and staff are great. So please appreciate them and leave a tip at the end of your stay. Our Villa Manager will meet you at the villa and orientate you to the villa and tell you how to work the important things/appliances. Mini-marts like 7-11 are a short walk away on the main road, but we will give you a welcome pack to start you off. There are lots of smaller Thai restaurants nearby on the main road and you are a short drive away from the busier Choeng Mon or Bangrak (Big Buddha) areas. All electricity use for your stay is chargable. We take meter readings at the beginning and end of your stay and calculate your bill based on what we are charged per kWh.